Need flowers fast? Forgotten Mum's birthday? Need them delivering the same day in Middlesbrough? Don't worry! Just call us the superheroes of the gifting world! At Butterflies Florist in Middlesbrough we can deliver fresh bouquets, baskets and arrangements the very same day in Middlesbrough it's and surrounding areas. We do have a same day cut off of 1pm. But if you place your order before 1pm we'll deliver the bouquet of your choice in the local area the same day. Orders for outlying areas would need to be placed before 12noon. 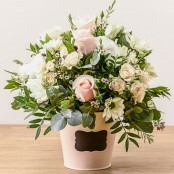 Please note that some flowers are not always in stock so if ordering for same day delivery please try not to pin us down on specific flowers too much (or give an alternative when ordering in case certain stems are not available) this way we can use the best flowers we have in stock to create the pefrect gift for your recipient.